The Jeopardy online contestant test was very difficulty. There were 50 questions, each of which had to be answered within 15 seconds. I assume that thousands of people took the test and that maybe 100 will eventually appear on the show. I doubt very much if I will make the cut. Why is this man annoyed? 99.9 % of the population of New York and New Jersey will be watching the Superbowl on Sunday while this poor guy will have to work at the NJIT Library. No Joke, It's True! NJIT's biggest football fan will have to work behind the circulation desk on Sunday night. He says he's been lurking here, but maybe he will motivated to make a comment. Let me quote John Lennon and Paul McCartney for today's entry. I'm So Tired from the White Album. Last night we went to the new Prudential Arena in Newark to see the New Jersey Devils play the Montreal Canadians. I was never a big hockey fan, but I wanted to see the new arena which is pretty close to NJIT. I saw my very first hockey game at the old Madison Square Garden in late 1963 shortly after the Kennedy assassination. Hockey has a reputation of being a cult sport. There was a saying that the same 17,000 people at a Ranger game would be there every night. In last night’s game the Devils were led 3-1 after 2 periods but lost 4-3. It is a small world since Stewart Bodner, a colleague at the New York Public Library (NYPL), was sitting in the row behind me. I left NYPL is 1990, but I have encountered Stewart a number of times over the years. Karen and Lee finally experienced my miserable commute from Queens to Newark. They met me at the train station at 5:30 PM. We ate dinner and walked over to the arena. The game ended at 9:30 and we arrived home at 11:15. I hope they understand what I have to go through to travel to work each day. I have done this miserable commute for 15 1/2 years now. I have grappled many times with the option of moving to New Jersey, but elected to stay in Queens. Either decision would have its consequences. The Knicks reach the half way point in the season at 13-28 which is pretty poor considering all the money that the players get. This will be the only Knick game we go to this season. It is $45/ticket to sit in the 300 level to watch a losing team. It turns out that the Distinguished Professor of Saturday Night Oldies was also at the game. he dropped by our seats and chatted for a while. Joe McCoy appeared on the WCBS-FM Radio Greats show last night from 7 - 10 PM. Joe's claim to fame was being the stations program director from the early 1980s until 2004? (I don't know the precise dates) He made WCBS-FM into America's premier oldies station. I especially enjoyed the specialty shows that he created on the station. He hired some fantastic DJs who became legends in their own time. I had the pleasure of meeting Joe last summer in his secret identity. Right now Joe consults for the Breeze, a radio station on the Jersey shore. So last night I was watching the Giants on TV while listening to Joe on my Sony Walkman. For the second time I am registering to take the online test for Jeopardy. The actual test will be Tuesday January 29th at 8 PM. From what I have read thousands of people try to become contestants every year but very few actually succeed. When the family watches the show I get a high five when I get a question right while all TV contestants miss it. It happens a few times each show. I get a big high five when I answer the final Jeopardy question correctly while all 3 contestants fail. That happens a couple of times a year. Johnny Podres, who became a storied figure in Dodgers lore for pitching Brooklyn to its only World Series title before the team moved West, died Sunday at Glens Falls Hospital. He was 75. (from http://si.com) Johnny won the 7th came of the 1955 World Series to give the Brooklyn Dodgers its only World Series victory. Don Cardwell, a pitcher on the 1969 World Series-winning New York team dubbed the "Miracle Mets", has died, the Major League Baseball said Tuesday. I sent a message to the Decalcomania Yahoo group remarking that there are very few contributions to the newsletter. Rich Appel certainly does a fine job with Hz So Good, but the publications needs more contributions representing different aspects of our collective interest in radio broadcasting. I remember that I first used e-mail and accessed the Internet in the fall of 1992 when I came to my current position at the New Jersey Institute of Technology. I discovered the Usenet group rec-radio that was moderated by the late Bill Pfeiffer. Sometime in late 1992 I encountered Paul Richards who told me about Decalcomania which I joined. In December 1993 we had a gathering at Bob Smolarek’s house in High Bridge, NJ. We traded airchecks and shot the breeze about radio. About a year later many of the same people met at Paul Richard’s home in Matawan, NJ. There we planned the Decalcomania Convention that took place in July 1995 in East Brunswick, NJ. I remember visiting WRSU (Rutgers University) and WAWZ in Central New Jersey. The last gatherings of Decalcomaniacs that I attended was in August 1999 when Ken Hawkins invited the New York/New Jersey contingent to his sister’s home in Elizabeth, NJ. I must congratulate George Greene who came from Ohio to all the gatherings that I have just mentioned. America Online (AOL) had folders for enthusiasts of specific radio stations that were open only to AOL subscribers. It was set up by Walt who grew up in New York but moved to Philadelphia. We never had more than 6 or 8 regular posters we held gatherings in New York City in 2000, 2001, and 2003. In our last meeting Lauren who came from Wallingford, Ct. taped the Dan Ingram show that turned out to be his last broadcast on WCBS-FM. In June 2005 listeners were outraged at the abrupt flip of WCBS-FM to the hated Jack format. Jeff from Union, NJ organized a rally by the Viacom building in Times Square. I would have loved to be there, but I was on vacation in San Francisco at the time. I arranged a gathering of oldies radio fans on June 3, 2006 the first anniversary of the dreaded format change. It was held at Ellen’s Stardust Diner in Manhattan’s theater district where the waitresses actually sing I originally anticipated a crowd of about 20 but over 60 came. The guest of honor was former WCBS-FM personality Bobby Jay. In June 2007 WABC organized a cruise to celebrate the history of the station as both music and talk station. Celebrities on the cruise included Cousin Bruce Morrow, Dan Ingram, Mark Simone, Curtis Sliwa, Mark Levin, Johnny Donovan, and comic Soupy Sales. Photos from this event may found at http://picasaweb.google.com/Bigtownman/WABCCruise . All of these events could not have taken place without internet technologies. Sending e-mail is a lot easier and less expensive than making phone calls. Maybe in future issues, there will be articles about other get togethers that have taken place over the years. WCBS-FM has a radio greats show on Sunday nights. Tonight Bobby Jay appeared on the show. It is his first appearance on the station since the injustice of June 3, 2005. Bobby really sounds terrific playing the classic soul that his audience wants to hear. Bobby has a regular gig on Sirius Satellite radio. 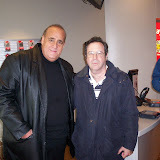 I had the pleasure of meeting Bobby at gatherings of radio enthuisasts on June 3, 2006 and December 1, 2007. Today we drove out to CW Post in Brookville, Long Island to se their basketball team beat St. Thomas Aquinas 75-56. At the same time the NJIT basketball lost today to Columbia 64-52 to start their season at 0-18. You can't get any worse than that. Maybe my favorite bean counter should become the coach. Before we left the house we flipped between two games on TV. St. Johns lost to DePaul 60-54 while Hofstra lost to VCU 54 - 49. When I looked at my last pay stub I saw that I have 157 accrued hours of vacation time. Since I had to schlep from Queens to Rutgers in New Brunswick, NJ yesterday I thought I may as well take a vacation day today. Since it is slow in the NJIT library during the intersession, I thought I may as well take the day off. Today is supposed to be unseasonably mild, so I will be a gentleman of leisure today. Today, was the annual meeting of VALE (Virtual Academic Library Environment), a consortium of university libraries in New Jersey. I attended sveral sessions which help me keep abreast of of developments in the field. It was good running into colleagues from other universities whom I may only see once a year. It's nightime in the big city. It's about 6:30 PM and again I have faced another delay from New Jersey Transit. A package sent through Dave D's competitor is on the table. It has two t-shirts that I ordered for Lee. On with the Beatles and the other with Elvis Presley. It is ironic that it arrived on the King's birthday. When Lee was about 5 years old he saw a statue of Elvis at a county fair and feel in love with him. When we visited Graceland in 2003, most of the visitors had not bee born when Elvis died in 1977. Every Monday I listen to the online version of Breakfast with Beatles with Dennis Mitchell on the Internet. Q-104.3 has a Breakfast with the Beatles show on Sunday Morning. I remember in early January of 1964 when I was in the 9th grade at Russell Sage Junior High School that WINS, WABC, and WMCA played I Want To Hold Your Hand every 10 minutes. Those were the days. We saw Hofstra beat James Madison University 66-60. Hofstra at 3-9 has a similar record to the Knicks (8-23), but the ticket prices are much less. Din, Dave - thanks for you kind wishes. I am feeling much better now and will return to work tomorrow. I had time to listen to my Accurian HD radio which I bought in October 2006. HD radios have been advertised extensively, but they have not caught on. The sound quality is excellent and I like the feed that tells you the song and the artist. I bought that radio to get the "stations between the stations" not available on an analog radio. Back then I got it to get the oldies on WCBS-FM-HD2 which were taken away from 101.1 FM by some jackasses who didn't understand the heritage of the station. Anyway on July 12, 2007 the oldies or should I say Greatest hits were returned to 101.1 while the Jack format was relegated to 101.1 HD2. Today I listened to the following HD stations. There are other HD2 stations from NYC which play music that is not for me. There are a fewAM stations that broadcast in HD to improve the quality. I checked out WFAN and WABC for a shor time. I stayed up just past midnight to see the ball drop in Times Square. It has been years since we've been out on New Years Eve. It seems that no matter how late I stay up, I can't sleep late in the morning. I woke up at 6:30. Since it was raining in the morning, we decided to go to the movies. We saw The Great Debaters starring Denzel Washington. By the time the movie ended at 12:30, the rain was over. We walked over to Wendys for lunch.